Born in 1974 in Johannesburg, South Africa, Debbie's family were part of the French Hugenot's that landed in the Cape and later moved up to Rodesia ( Zimbabwe ). She spent her childhood out in nature on a smallholding south of Johannesburg with her family who had a strong artistic influence on her. Debbie's very first thoughts of a career were to be a Game Ranger.... then a Veterinarian.... but the thought of dealing with injured animals soon changed her mind. Finally it was her Grandmother's influence of being an Art Teacher, that helped her to express her love for Wildlife through her artwork. Thinking that painting could only be treated as a hobby, Debbie got her Diploma in Commercial Art and completed a Computer Graphics course. She then started her career as a DTP/Graphic Artist with a passion for Photography! 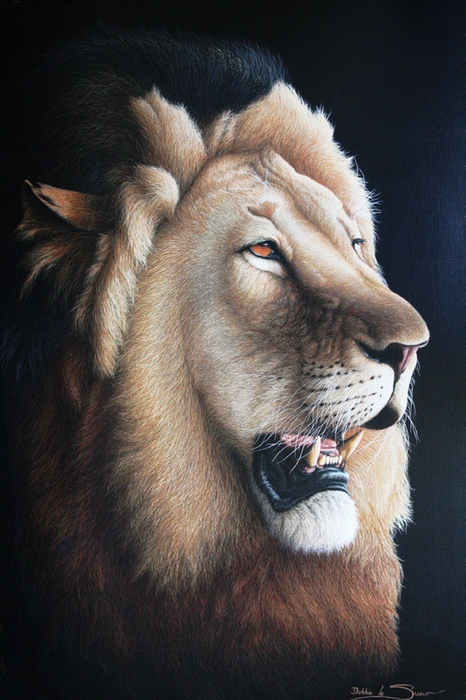 in 1998 Debbie started her career as a Wildlife Artist, being self taught, she has developed her own unique style, using a technique that makes her paintings very realistic, she loves using sharp contrasts and focuses on the eyes, bringing the animal to life as they communicate with the viewer. It was her parent's influence of meticulouse perfection that moulded Debbie into being a Realist, although she loves the Abstract Artwork that her Grandfather produced! Debbie is recognised Internationally and has painted extensively on leather which creates a unique and rustic surface for her artwork, however recently she has moved more to canvas. 2009 Exhibited with the JAPAN WILDLIFE CENTRE at the Machinda City Museum of Graphic Arts in Tokyo. Proceeds to Wildlife Protection & Awareness! 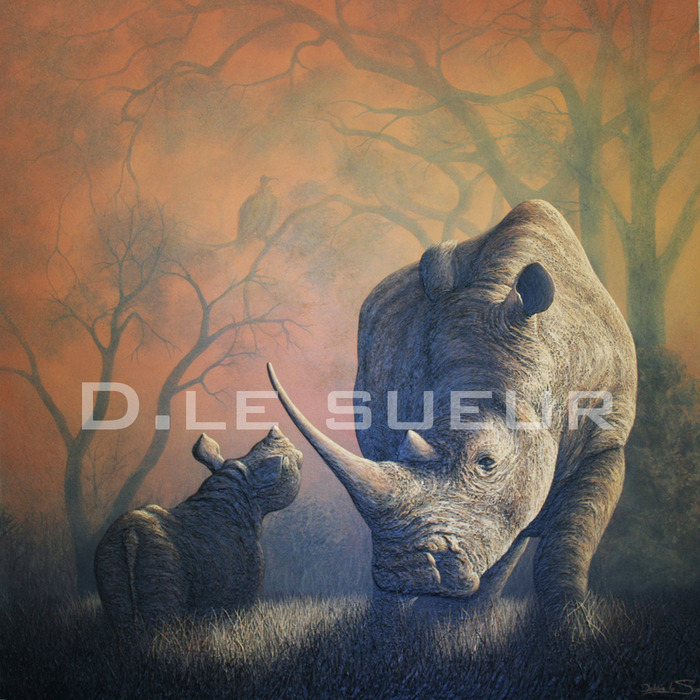 May 2012 Debbie was chosen to Exhibit at the Mall Galleries in London in the DSWF WILDLIFE ARTIST OF THE YEAR Competition - Proceeds donated to help save Wildlife in Africa and Asia. ‘I will be your voice’ Supporting the Rhino Foundation; Seaside Village Table View Cape Town. Pause; the annual wildlife exhibition at The Cape Gallery. 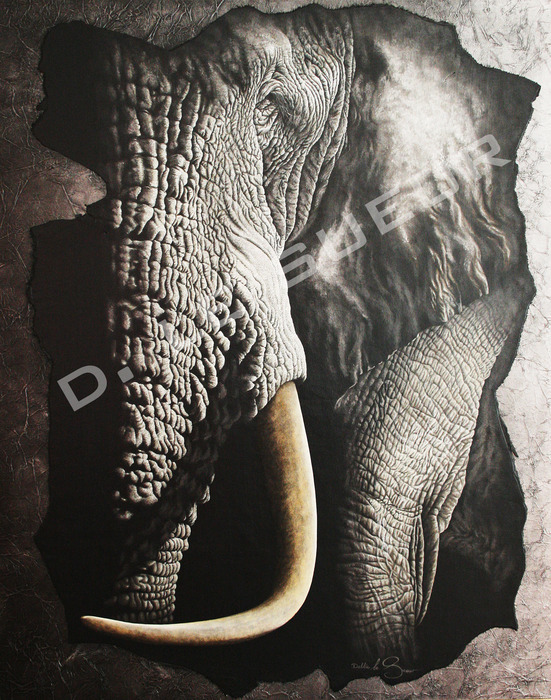 2012 'Pawsing Preditor' was awarded 3rd Overall Prize in the LST 'ANIMALS' Competition and 'Elephantom' received a Special Recognition Award and was sold in London at the DSWF Artist Of The Year Awards. Debbie pays every attention to detail, using strong contrasts and focussing on the eyes as she brings the animal to life as they communicate to the viewer. Each painting was created with time, love and perfection! Debbie strives to show the beauty that we, as Man are distroying! THE KING, a Powerful Creature that needs no introduction! He gracefully greets the new day with his dominant pride! A test of pure Strength is shown as these magnificent giant Elephant Bulls battle for dominance. 2 Dimensional Mixed Media on leather. This Painting can only be properly viewed and appreciated with close up detailed sectional pictures, for more info email: info@homeads.org! Endangered African Rhino. In a seemingly Peaceful habitat a Mother Rhino roams with her calf, unaware... but the vulture awaits the DANGER that lurks. Every day 'Vultures' are destroying this magnificent species for their own selfish gain. 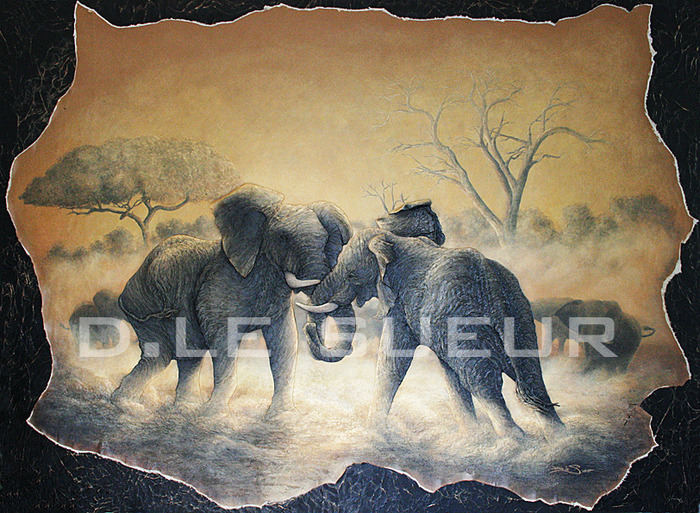 Chosen to be Exhibited and shortlisted for the DSWF Artist Of The Year 2012. Elephantom was sold on the Opening Preview Evening with all proceeds donated to help save Endangered Wildlife in Africa and Asia. Acrylic on Leather. SPECIAL RECOGNITION AWARD. Limited Edition Giclee Canvas Prints available: email info@homeads.org . (SOLD) WAITING... Ready to POUNCE! 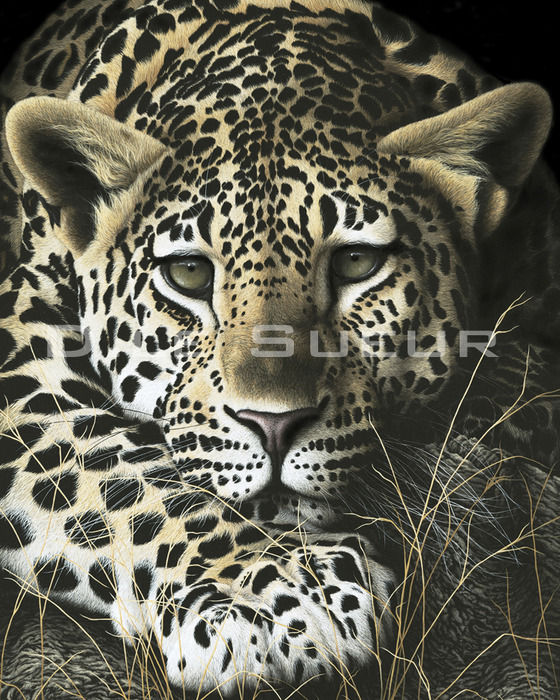 The Mystical African Leopard is my favorite subject choice, I am completely in awe of their Strength and Beauty. 'Pawsing Preditor' was AWARDED 3rd OVERALL prize in the LST 'ANIMALS' Art Competition in August 2012.